Temperatures dove more than 30 degrees below zero Thursday morning in the Midwest in this polar-vortex outbreak’s last gasp. Norris Camp, in northwest Minnesota, was the coldest location in the United States on Wednesday after temperatures there dropped to minus-48 degrees, measured by an official with the Minnesota Department of Natural Resources. With winds blowing at 5 to 10 mph, wind chill would have been around minus-65 degrees. Several other locations in Minnesota and North Dakota plunged to dangerous lows, including Warren, Minnesota (minus-47); Lisbon, North Dakota (minus-46); and Park Rapids, Minnesota (minus-42). Temperatures ostensibly increased Wednesday afternoon to readings like minus-18 in Grand Forks, North Dakota, and minus-22 in Rockford, Illinois, but it didn’t take but a few hours for the mercury to plummet again to readings well below minus-20, minus-30 and in some locations in north-central Minnesota, minus-40. At the National Weather Service in Duluth, there was “talk of making a run at the state record” early Thursday morning before the sun came up, when temperatures would be at their coldest, meteorologist Geoff Grochocinski told The Post. Minnesota’s current record low is minus-60, and it was set near the city of Tower in 1996. As of Thursday morning, the Weather Service still thought the record could be possible. It probably would not happen at an official reporting station, which are usually airports, but would likely come in mid-morning from one of its cooperative weather observers in the coldest locations in Minnesota. Another significant record is in jeopardy in Chicago; Thursday morning lows will plummet close to the city’s record low temperature of minus-27, set on Jan. 20, 1985. And the state record in Illinois – minus-36 degrees set in Congerville on Jan. 5, 1999 – seemed likely to be broken Thursday morning somewhere in Northern Illinois, west of Chicago. 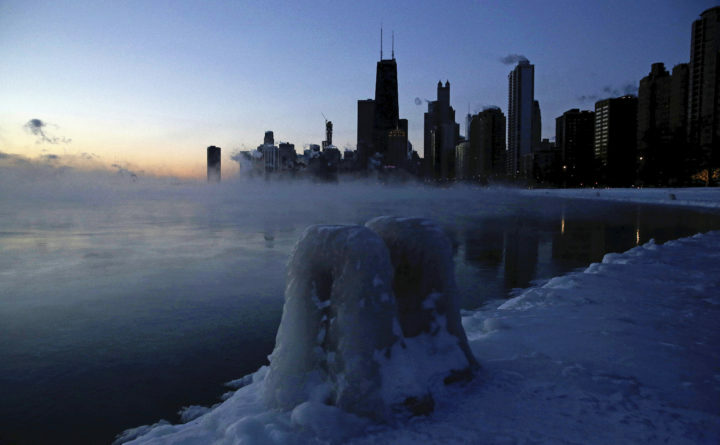 Wednesday was the second-coldest day in Chicago’s history. The maximum temperature, minus-10, was set just after midnight, and then the mercury dropped to minus-24 later in the morning. The combination of those extremes results in a daily average of minus-17, just short of Dec. 24, 1983, when the average temperature was only minus-18 in the Windy City.